Treasure Hunters: Booktrack Edition adds an immersive musical soundtrack to your audiobook listening experience! 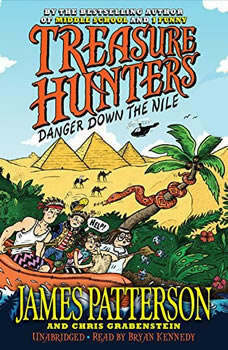 * From #1 New York Times bestselling author James Patterson comes a brilliantly original adventure series, jam-packed with action, humor, and heart!The Kidd siblings have grown up diving down to shipwrecks and traveling the world, helping their famous parents recover everything from swords to gold doubloons from the bottom of the ocean. But after their parents disappear on the job, the kids are suddenly thrust into the biggest treasure hunt of their lives. They'll have to work together to defeat dangerous pirates and dodge the hot pursuit of an evil treasure hunting rival, all while following cryptic clues to unravel the mystery of what really happened to their parents-and find out if they're still alive. *Booktrack is an immersive format that pairs traditional audiobook narration to complementary music. The tempo and rhythm of the score are in perfect harmony with the action and characters throughout the audiobook. Gently playing in the background, the music never overpowers or distracts from the narration, so listeners can enjoy every minute. When you purchase this Booktrack edition, you receive the exact narration as the traditional audiobook available, with the addition of music throughout.